Nov. 20, 2014, Portland, Or. - Lightspeed Aviation has announced the launch of The Lightspeed Aviation Adventure Flight Bag collection. 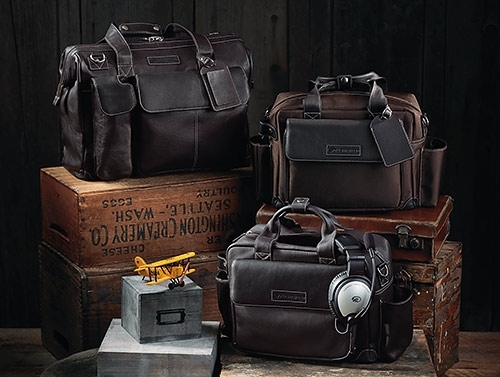 The collection includes two bags made of full-grain South American cowhide, and one made of ballistic polyester with full grain cowhide accents. Designed for the modern pilot, each bag incorporates features like purpose-built pockets for headsets, iPads, portable cameras, transceivers, and water bottles, as well as rugged, but wing-friendly, textured PVC bottoms. There is also an optional organizer insert that when combined with any of the flight bags aids with keeping each item in its place. Each bag is inspired by the famous aviation author for whom it is named and the collection includes The Gann, The Markham, and The Antoine. Prices range from $179 to $249. “Anyone who owns a Lightspeed headset will recognize the beauty, ingenuity, and durability of a product destined to make flying more enjoyable for years to come.” said De Mers.